A Karen National Union delegation led by its chairman, General Saw Mutu Sae Po met unofficially with Burma Army’s Senior General, Min Aung Hlaing, to discuss the fighting in the Papun area of Northern Karen State. The KNU and the Burma Army met on Thursday, May 17 at the Yangon Command Headquarters in Rangoon. The informal meeting lasted for three-hours as the two sides discussed; the peace process and the recent fighting between the Burma Army and KNLA troops in the KNU’s controlled area. The two sides worked to find ways to solve the problem by political and peaceful negotiation. Speaking to Karen News right after the meeting, General Saw Issac Poe, a member of the KNU’s delegation team said. The KNU released a statement and confirmed the agreement was reached for the Tamadaw [Burma Army] to stop work on the road building between Kay Pu- Ler Mu Plaw in Papun district – the cause of the recent fighting. The KNU statement said that it was agreed the Tamadaw [Burma Army] soldiers responsible for security on the road construction are to withdraw to allow villagers displaced by the fighting to return to their villages. The villagers have been guaranteed that they will be allowed to work on their farms without the worry of Burma Army soldiers in their area. 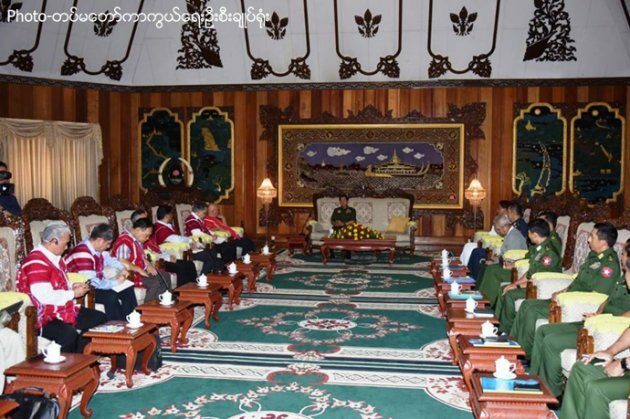 The KNU’s delegation was received by Senior General Min Aung Hlaing, General Tin Aung San, the Navy Chief, General Maung Maug Kyaw, Air Force Chief and other senior officers from the country’s Arm Forces. The KNU delegation included its chairman General Saw Mutu Sae Po, Padoh Kwe Htoo Win, vice chairperson, Padoh Saw Ta Doh Moo, General Secretary, General Saw Johnny, Chief of Staff of the Karen National Liberation Army, General Issac Poe, Colonel Saw Ta Mla Thaw, Padoh Saw Roger Khin, head of the KNU Defense Department, Padoh Saw Shwe Maunn and Major Saw Htoo Htoo Lay, a KNU advisor. In early March this year, the Burma Army restarted work on road between Kay Pu – Ler Mu Plaw. The additional soldiers deployed as security for the construction, by Burma Army, entered KNU restricted areas and this led to armed clashes with KNLA. The Burma Army advancement caused over 2,000 villagers to be displaced, the largest forced displacement of civilians in Mutraw (Papun) since the Karen National Union signed a bilateral ceasefire with the Burma Army in 2012.